Best Interior Decors Bangalore – Lighting is an essential thing for every home. Both too much and too less lighting look bad in a home. A perfectly glowing home requires smart decisions while choosing lights. The best trick is selecting the right amount of lights so that the room is perfectly lit. The room looks better when the lights are placed in the right position. 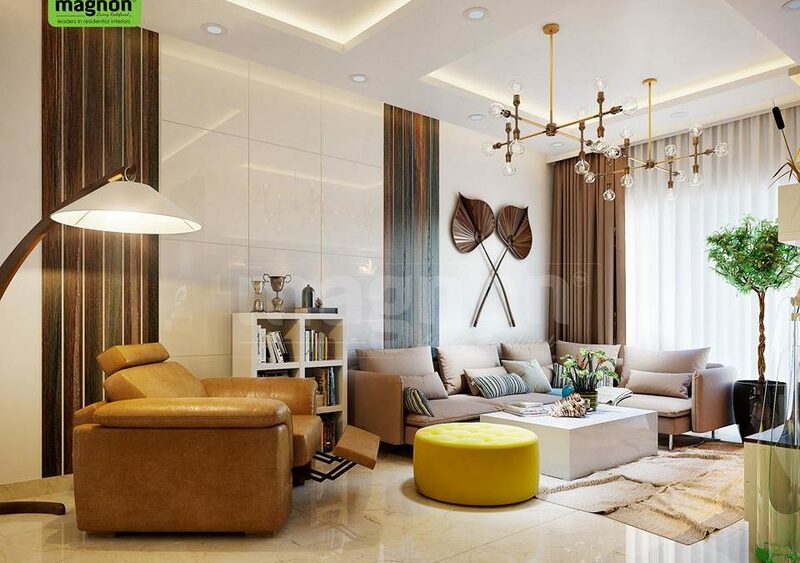 According to Interior Designers in KR Puram, every part of your home requires a different type of lighting. According to how much light you need in the rooms, different types of flashes are selected. Among the four different types of lighting, ambient, accent, task, and decorative, you have to use the right kind in every area. First of all, decide which part of the house will be used for what purpose and then it will be easy to decide lighting type. To help you more, here is a simple lighting guide for every home. Interior Designers in Bangalore will explain you everything. What is the primary focus of a dining room? The lighting in the room should be focussed on the table so that there is no lack of brightness. You might need to choose high lumens light for the dining room if the paint in the room is darker. A table lamp would be a perfect solution for task lighting. A chandelier just above the table will not only make the room look elegant, but it will also light up the table. For other parts of the room, you can for usual wall mounted lighting. The kitchen is one of the busiest places in the house, and that’s why you need to light up it correctly. The central part of the kitchen where most of the work is done is sink and stove. You might have noticed that sinks are often located near the window only, and that’s to capture natural light while working in the kitchen. One of the good ways to light up the countertop is by adding lights below the cabinets. It will help you have the perfect amount of light on your stove. You might also need one or two ceiling mounted lights to make the area appear brighter. A first important part of a bedroom is closet, and if you prefer reading in the bedroom, reading lights must be your second concern. The Luxury Interior Designers in Bangalore the adjustable wall mounted lighting fixtures are best if you want bedside reading lights. Avoid central ceiling mounted and harsh lighting because this area should feel relaxing. Architectural lighting, floor lamps, wall mirror, or a pair of sconces flanking can do the best job if you want to enlighten the room without making it too harsh to bear. Outdoor lighting is essential for so many reasons. The darkness around the home doesn’t look good plus the lighting also aids security. First of all, find out all the places that need to be light, i.e., the corners, garden area, and the street part. The outside lighting also prevents reflection of glass surfaces from inside. Well, don’t make it appear like a study room, it only needs to be enlightened so that people passing by can see through it. The entry part of the home must be well lit. There should be a bright light so that the house number and all are visible. You can either go for ceiling mounted light or wall mounted light on both sides of the entry gate for perfect illumination. You also need to create good lighting in the stairs area. The steps can be brightened with ceiling mounted lights for better visibility while walking. The space under the stairs also needs lighting so that no one or nothing can hide there. The bathroom too requires ambient light plus here you need to be smart while fixing the lights. Since this is the self-grooming area, one needs an ample amount of light while seeing themselves in the mirror. So heres the Best Interior Designers in Bangalore the quick-tip here is to have lights on both sides of the mirror. To prevent shadows in the bathroom, avoid overhead lights. Wall mounted light placement will work better because it will prevent both shadows and glare on the mirror. Home office or study room needs to be illuminated in the best way. Don’t mind taking help of the Best Interior Designers in Bangalore to make sure that your home office is perfectly lit. First of all, the light in the room must not disturb your working on the computer screen by making reflections. The second thing is to make sure that the working area is free from any shadows. Use ceiling mounted, or wall mounted lights for the whole room, and place lamps on the work table for task lighting. The living room is the place where the whole family spends a lot of time, and that’s why it needs to be adequately illuminated. For ambient lighting in the room, you must for bouncing light off the ceiling. How it helps is, it prevents shadows and makes a room appear fully bright. Use either ceiling facing or wall facing lights in the area to make it appear fully lit. You can also bring in table lamps to make the room look brighter when required. If your living room is large, you might need multiple lamps or separate lights on opposite walls.